Now it’s July, we’re able to say that we have two challenges this month. That’s a little scary since at the end of the month it’s a big one for a lot of us! On Sunday 13th a group of us are travelling up to London to complete the British 10K. The route winds its way past some pretty famous landmarks and the atmosphere should be fantastic, so that’s going to be a good one. Just two weeks later, ten of us are driving up to the Yorkshire Dales National Park so we can get up at the crack of dawn to walk up and down three mountains! We’re going to complete the Yorkshire Three Peaks Challenge, a 24 mile hike that needs to be finished within 12 hours. It’s a real mixed ability group, ranging from very fit to pretty unfit (me!) so it is definitely going to be a challenge. Then just two weeks after that (there’s definitely a pattern emerging here…) Luke, Anthony, Tom and Lee are starting their epic Kent coast kayak challenge. They are going to attempt to kayak the 150-mile Kent coastline in five days. Bearing in mind, none of the group had even sat in a kayak before the beginning of the year, this is no mean feat. We’ve been busy with our training and fundraising. To help our efforts, we’ve created YouTube videos for each giant taking part in the Challenge SGM activities this summer so we can share them on social media, etc. 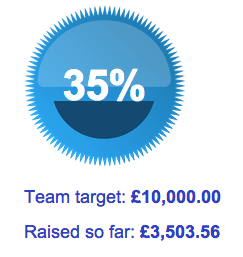 As you can see, we’re not doing too badly with our fundraising. But there is still a long way to go! It’s really easy to donate. If you can spare us just £2 that would really help us to reach our target. All you need to do is to text CSGM49 £2 to 70070. £2 will come off your mobile bill and go straight towards helping Combat Stress to continue their hard work, which relies on charitable donations. Thank you to all our corporate sponsors so far!